Jenny Mikakos and Steve Dimopoulos caught up with Paul Mavroudis in Oakleigh’s Eaton Mall to tell him the good news that the Thessaloniki Association would receive almost $5,000 to upgrade its kitchen. More than 60 Greek projects will be funded through this year’s Multicultural Community Infrastructure Fund and Multicultural Festivals and Events program, Minister for Multicultural Affairs Robin Scott and Member for Northern Metropolitan Jenny Mikakos announced on Friday. The initiatives aim to ensure all of Victoria’s culturally diverse communities have access to safe, functional facilities to better use services, participate in social activities and share their vibrant culture with the wider Victorian community. As part of these programs, an array of Greek community organisations are to receive more than $1.3 million to upgrade community facilities, purchase new equipment and hold cultural events. Some of the Greek community organisations to be funded this year include the Pontiaki Estia social club which will receive $250,000 to fix the façade of the club and restore structural issues so they can continue to hold dance lessons and other social activities; Fronditha Care to get $250,000 to develop the Greek Community Centre in Mulgrave; the Greek Orthodox Archdiocese Parish of Coburg and Pascoe Vale to receive $250,000 for a building extension; the Greek Orthodox Community of Dandenong and Districts to renovate their halls with $150,000; the Thessaloniki Association which will receive almost $5,000 for a kitchen upgrade; the Olympian Society to get almost $3,000 to upgrade their kitchen appliances. 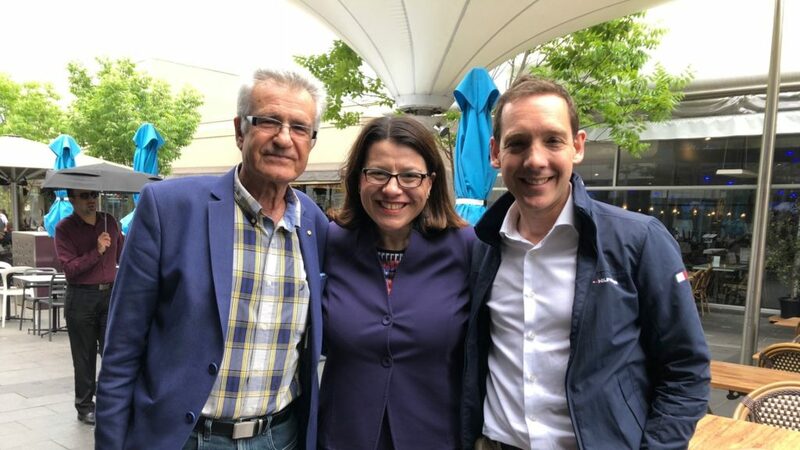 “Victoria’s Greek community have made immeasurable contributions to the social and economic life of our state,” said Victoria’s Minister for Early Childhood Education (and Member for Northern Metropolitan) Jenny Mikakos. Minister Mikakos also visited Oakleigh Grammar Early Learning Centre this week, alongside Labour MP Steve Dimopoulos, where they had the opportunity to present Labor’s $17.9 million Early Childhood Language Program, which will allow 150 kindergartens across Victoria to offer weekly sessions in one of 15 languages, and a further 10 to run a bilingual program. “We know that learning another language has great rewards – it’s fun, it improves brain function and actually helps kids learn English better,” said Minister Mikakos. “This Australian-first initiative is going to put little Victorians at the front of the pack and ready for school,” she continued stressing the benefits of more than 5,000 little Victorians learning a new language while at kinder, making the most of these early learning years. “From ‘yiasas’ to ‘ni hao’ – we’re giving our children the chance to be immersed in the wonderful languages of the world and it’s terrific to see that Oakleigh kids will be among the first to benefit from this amazing program,” added Member for Oakleigh Steve Dimopoulos. Oakleigh Grammar’s Childhood Language Program will receive government funding to run a fully bilingual Greek kindergarten program from 2019, as will Alphington Grammar Preschool and Clever Kids Childcare in Ashburton. The weekly sessions will cover a range of languages apart from Greek, including Mandarin, Arabic, Punjabi, Italian, Japanese, French, Hebrew and Spanish. Among the 160 kindergartens – a third of which are located in regional Victoria- 29 kindergartens will offer Aboriginal languages and 27 will teach Auslan.